The Discovery Globe: Build-Your-Own Globe Kit introduces the world of geography to budding explorers. 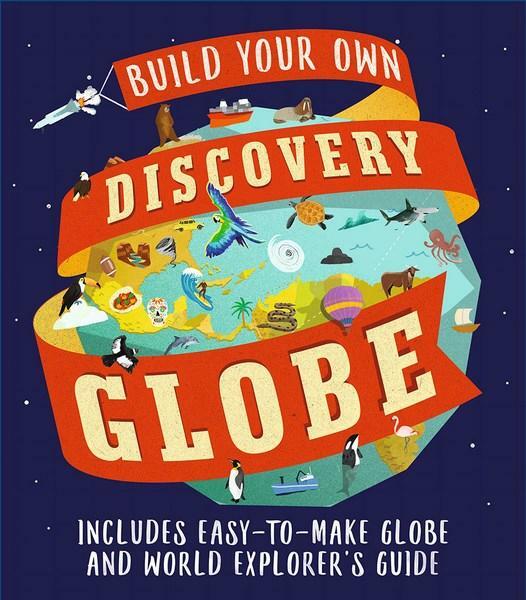 As the title suggests, it's a kit made up of a book and a DIYglobe. The book offers a summary of different environments found around the world, and some key geography concepts, such as time zones and biomes, as well as sharing a little of the world's different cultures. Also included are examples of natural wonders of the world (e.g. Mount Everest, Victoria Falls, Uluru), extreme weather (e.g. bushfires, tsunamis, volcanoes), and World Heritage sites such as Stonehenge, the Great Wall of China, and the Great Pyramid in Egypt. Readers are also introduced to the idea of megacities ('cities that are home to 10 million people or more') and unusual jobs from around the world (snake milker, snowmaker and flying doctor are just some of them). The many and varied animals that populate the planet (e.g. Japanese spider crab, cane toad, komodo dragon) are mentioned, as are endangered animals, and animal migration around the globe. An explanation of how to put the globe together is given at the beginning of the book. The globe is made of cardboard pieces that are pressed out of sheets, folded and inserted together, and once constructed, it sits on a long piece of dowel inserted into a cardboard stand. It features tiny icons of animals, forms of transport, sites of significance and more, and there's a guide to them in the back of the book. The end result is rewarding, but best suited to older children because it requires good coordination to put together (two pairs of hands would also be helpful). After having given this a go myself, I would definitely recommend using sticky tape to hold the pieces in place as they are slotted together!